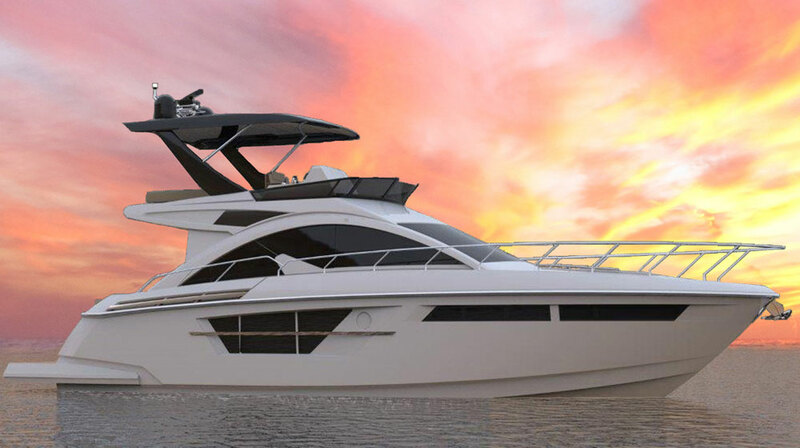 The 2018 Tiara Sport 38 LS launches a new line of boats for this iconic builder. 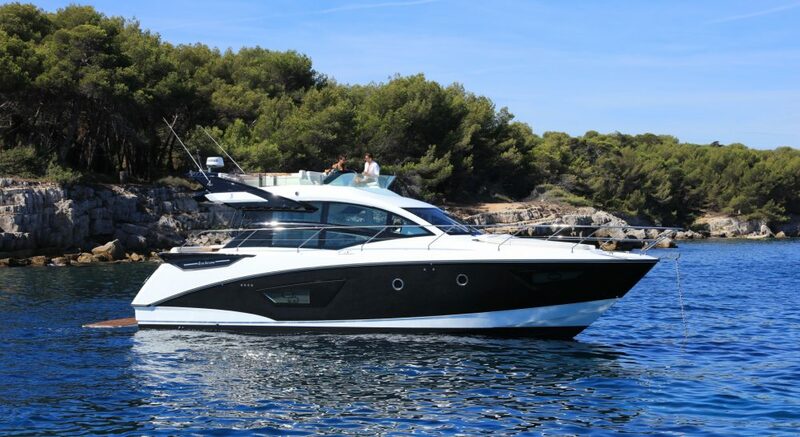 The all-new Tiara Sport 38 LS is completely unlike any Tiara we’ve seen before – even though this builder has been breaking new ground for several years, with unusual models like the Q44 Adventure Yacht, the 39 Coupe, and the F44 Flybridge. Each of these boats represented a departure of sorts for this builder, each looks quite different from Tiaras of the past, and each is unique in its own way. 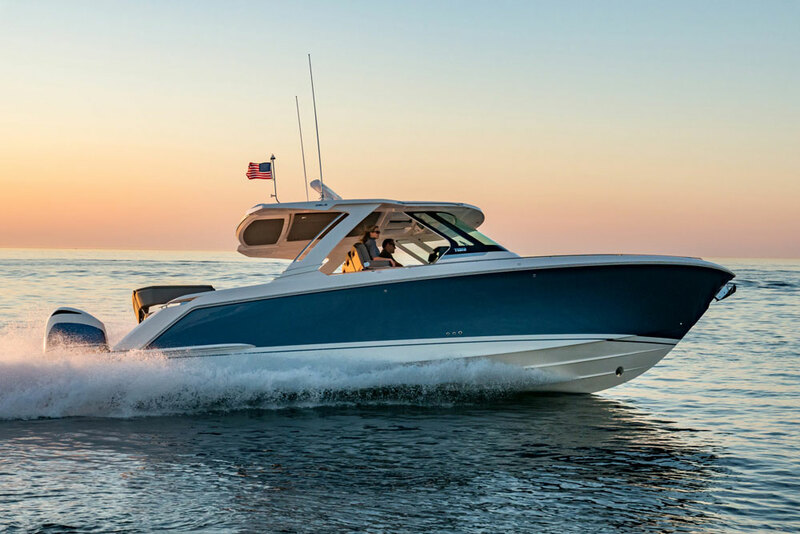 Yet rather than merely rolling out similar styles in different sizes, as boat-builders commonly do, Tiara’s opted to continue developing its chain of fresh starts with an entirely different kind of boat. 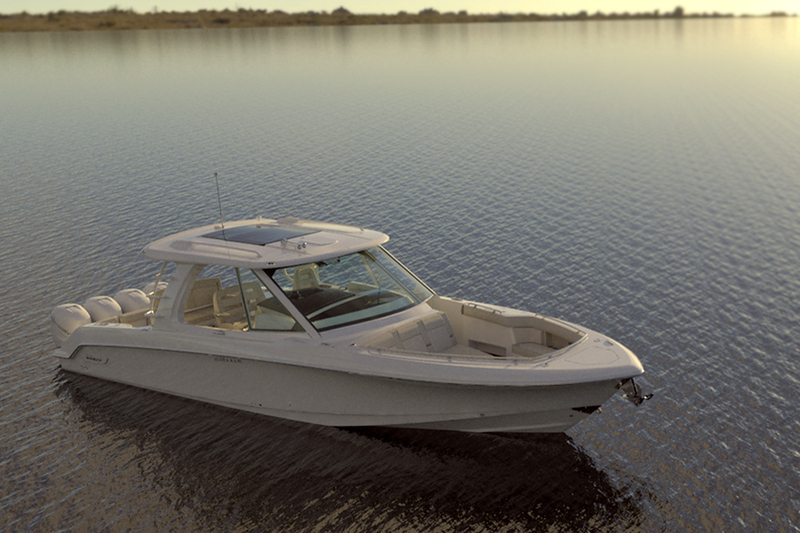 If you’re ready to have your concept of what makes a Tiara shattered and rebuilt, check out this Tiara Sport 38 LS: First Look Video. As the video plainly shows, the first way the Sport 38 LS sets itself apart from all other Tiaras can be found on the transom: it’s lined with triple Yamaha F350 outboards. 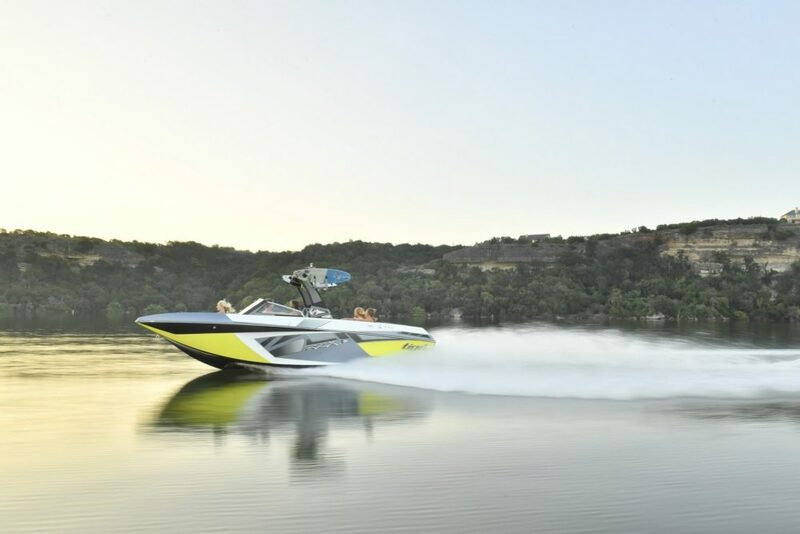 For a company that’s known for building only inboard and pod drive yachts, this is obviously a huge departure – and it’s also what puts the “sport” in its name. 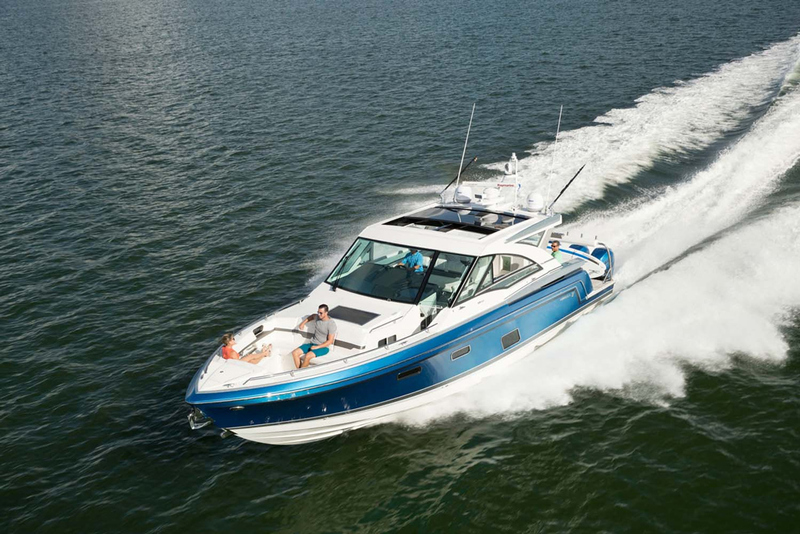 Though we couldn’t show you on film (the boat was locked in by dozens of others at the Fort Lauderdale International Boat Show), top-end speeds with these powerplants hits a blistering 55.6 MPH. 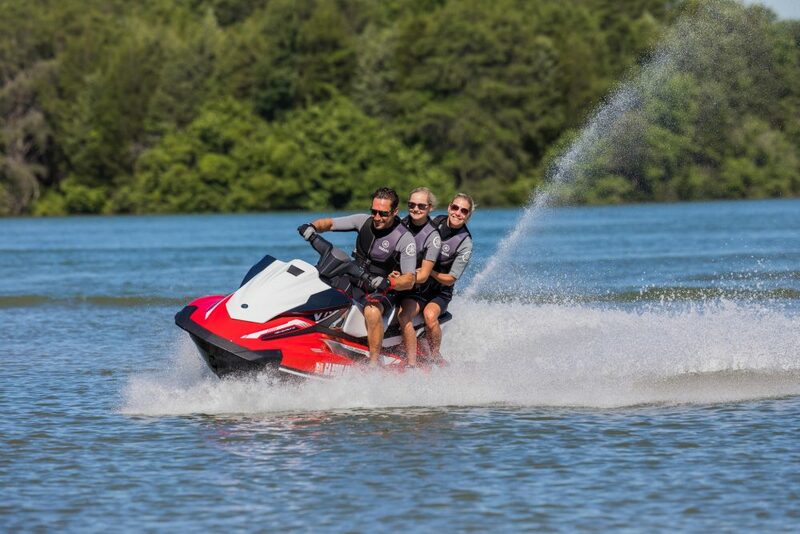 And at a 4500 RPM cruise, the Sport 38 LS zips across the water at 40.4 MPH. That kind of athletic performance is a first for a modern Tiara. Outboards on a Tiara? You bet—like we said, this boat is unlike any Tiara you’ve seen before. You don’t have to move one inch away from that cowl-lined transom to spot the next unique feature of this model: the spinning, for-and-aft facing settee and dinette. In standard cruising mode the entire U-shaped unit faces forward, offers seating for six, and looks rather traditional. But at the press of a button its position unlocks, and the entire thing spins 180-degrees so you can kick back and enjoy an aft-facing view of the water. Not only is this a first for a Tiara, it’s a first for any boat we’ve reviewed to date. The bow cockpit is yet another unusual move for Tiara, and although we’ve seen bowrider-style cockpits on a few other new boats recently, none of them are exactly what you’d traditionally call a bowriders. Yet all find ways to combine both a cabin and that bow cockpit in a mid-sized cruiser. In this case, that forward cockpit gets you a large, comfy lounge with fold-down arm-rests, cup holders, and room for three or four people to kick back in comfort. Adding a bow cockpit to a boat of this size does cut down on cabin space, but gives the boat’s fun-in-the-sun factor a huge boost. So, between that big cockpit with its rotating furniture, the bridgedeck (with a triple-wide helm seating including fold-down arm rests and flip-up bolsters), and that scooped-out bow cockpit, is there really still room for a substantial cabin? Substantial may not be the best word to describe the overnight accommodations on this boat, but the basics are all accounted for. There’s a berth, stand-up head, microwave oven, entertainment center with 29” LCD television, and a hanging locker. Sure, long-distance cruisers would want more room belowdecks, but this is a dayboat at heart and the relatively small cabin does get you weekending abilities for a couple. Those overnight jaunts will be enjoyed in comfort, too, thanks to touches like a standard 6,000 BTU air-conditioning system, sound-deadening insulation in the hull and deck liners, and a stall shower in the head. The décor is up-scale, with a teak and beech finish. 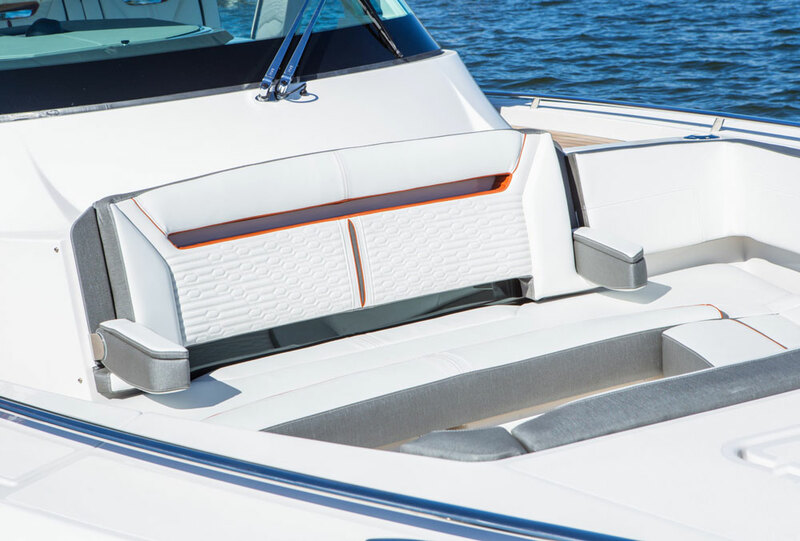 But perhaps most importantly, the berth isn’t one of those shoe-horned minis often found on dayboats that cram a cabin into what’s essentially a glorified center or side console. While we can’t call it a true queen berth and it narrows a bit at the foot, it certainly warrants being called a full-sized two-person berth, and it’s significantly larger than those found on many boats of a similar nature. How does Tiara create the extra room belowdecks, for that berth and the full-sized head? The absence of a cabin galley. 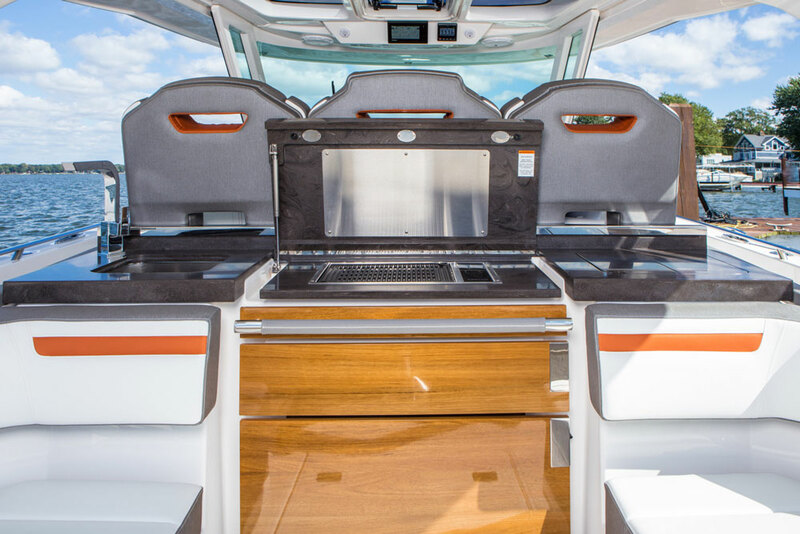 There’s no need to carve out space for one, since the Sport 38 has full food-prep abilities located abovedecks. The rear of that big helm seat has a galley built into it, including a freshwater sink, Corian cutting board, a 120-V/12-V 2.6 cubic foot refrigerator, a 120-V outlet, stowage compartments, and a trash can. All of those items are standard features but we’d also consider the 120-V electric grill a must-have. Maybe it’s not a huge deal in the grand scheme of things when a boat MSRPs at half a million dollars in stock form, but Tiara lists the grill as a $2,325 optional item. Whether it’s lunch on the hook or dinner during a long weekend aboard, the abovedeck galley is ready for action. One other option that we suspect will end up on most of Sport 38 LS’s leaving the factory is the aft cockpit power sunshade. Yes, it’s a bit steep at $16,500, but at the press of a button it extends out of the hardtop to shade the entire cockpit. There’s also a manually-erected sunshade available for the forward cockpit ($4,500), which was up when we kicked back and relaxed in—oops, we mean thoroughly inspected—the bow. We have to admit, it kept us cool and comfy under the blazing Florida sun. What about construction? This is the one area in which the Sport 38 is not unlike other Tiaras. The hand-laminated hull incorporates balsa-cored sides, the structural grid system is infused fiberglass, and the transom is five-ply resin infused and backed up with a reinforcement grid. The boat is built to ABYC standards and there’s an option for international certification. If you’ve ever owned or spent extended time aboard a modern Tiara, you already know that solid construction is more or less a given. Older Tiara designs certainly had luxury. 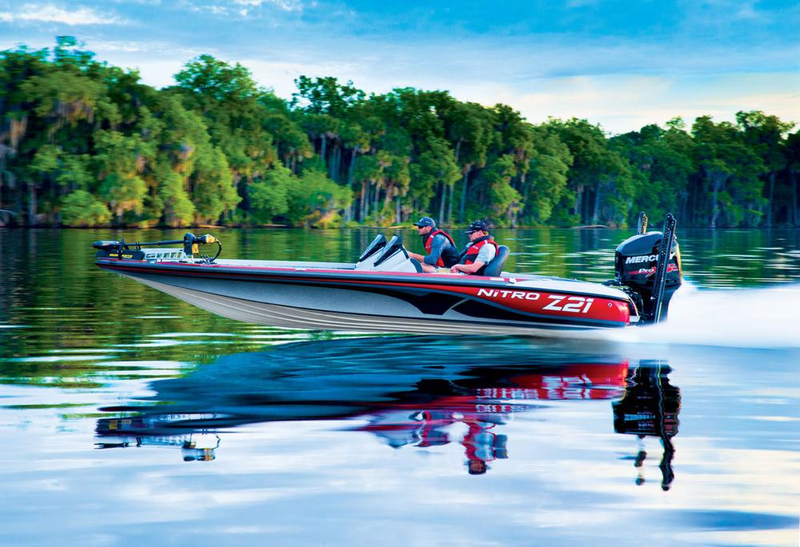 They offered many of the big-ticket perks and features found on the Sport 38 LS. And they’ve never failed with regards to construction quality or handling the waves. 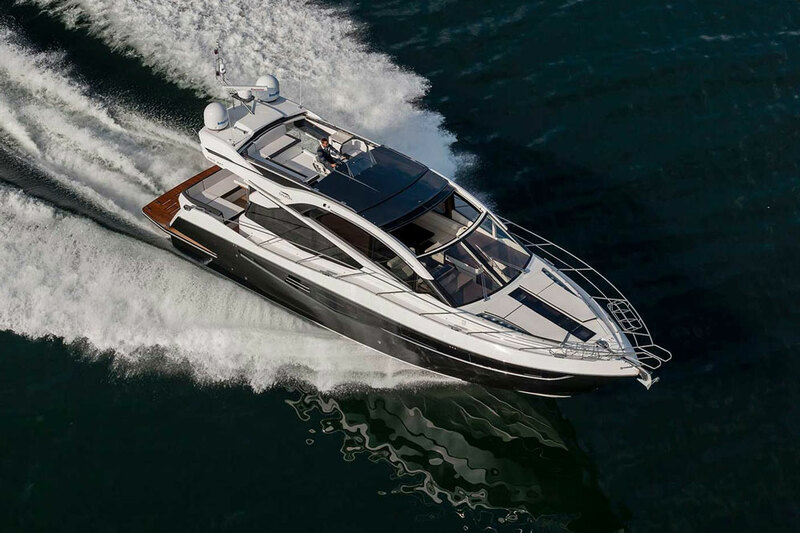 But when it comes to sport-boat performance and day-boat-style outdoor luxury, the Tiara Sport 38 LS does break new ground for this builder. It’s one more boat in a line of recent introductions that reshape how we think of Tiaras—and more importantly, reshape what you can do with one. Other Choices: The slightly smaller and somewhat sportier-looking Formula 350 CBR is another outboard-powered cruiser with a bow cockpit. Same goes for Sea Ray’s 350 SLX, which can be found in both outboard and stern-drive models and has a more traditional (if ginormous) bowrider-style layout and design. See Tiara Sport 38 LS listings.